Babies need fresh air and love being carried outdoors. 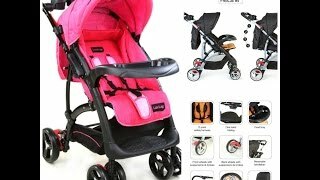 So, get this baby stroller from LuvLap and you are not going to think twice before carrying your baby with you, whether it’s just for a visit to the provision store or for an overnight stay with your friends. The lowest price of LuvLap Starshine Baby Stroller(3, Red) was obtained on April 25, 2019 11:17 pm. It was probably an old/used piece with all the screws rusted and white spots on the rods. When ever we make the toddler sit in it obviously they will keep movingand the seat Velcro doesn’t hold the seat cushion in place and it keeps coming down and making it uncomfortable to sit. A big R and D failure.